John MASKELL was born in Bromsgrove in 1834, the son of James FLAVELL & Harriet MASCALL. In the 1881 UK census John MASKELL and his wife, Jane, are both nailers and, along with John's mother Harriet and several of their children, are living at Sidemoor Common, Bromsgrove. Harriet FLAVELL is now a widow. Nearby her younger son, James FLAVELL is living with the family of her cousin, Edward MASKELL. John MASKELL and Jane WARDLE were married in October 1862. Their three eldest children were christened in September 1863. It was not unusual for children to be christened in groups, perhaps it was more ecconomical for poor families to do it that way. Nor was it that unusual for a couple such as John and Jane to wait until after the birth of children before formalising their marriage. The births of their two eldest children, William and Louisa, are both registered in the official UK Birth Indexes under their mother's surname of WARDLE. 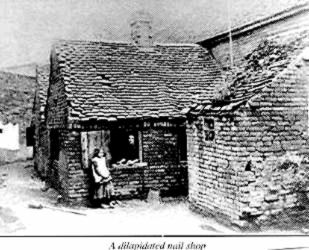 Possibly this may be an indication of the poverty endured by people in the cottage industries, such as the Nailers of Bromsgrove. Up until the late 1800s in Bromsgrove the Maskell surname had many spelling variations ie; Mascall, Maskell, Maskall and Maskill. A search of the IGI shows that all of these spelling variations could occur in the same family. By the time of the 1881 census though the spelling seems to have settled on Maskell but there are still many variations in the BMD indexes.